They say – “Better late than never” – well, this is how it goes for this gluten-free cornbread. I promised you this recipe an embarrassing long time ago when I posted my crockpot sweet potato chili recipe. 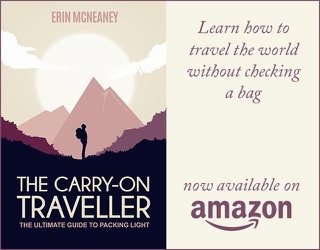 But then life got in the way – majorly! This post however, is about cornbread. The particular version is made from just cornmeal. Unlike most other recipes this cornbread requires no wheat flour at all, which makes this cornbread gluten-free! I found this recipe from Nicole at gluten free on a shoestring. As the title indicates her site is entirely dedicated to gluten-free recipes which absolutely makes her an expert. And Nicole sure knew what she did with this cornbread recipe. 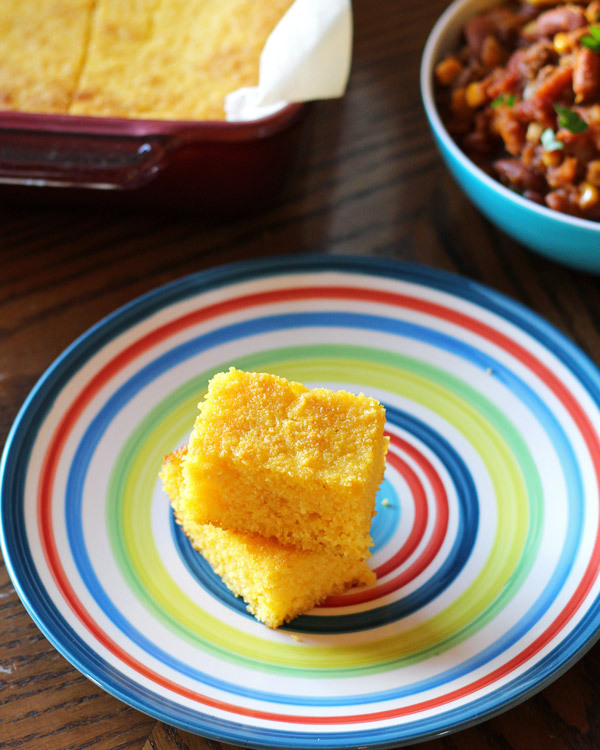 The cornbread comes out soft, light and fluffy with a slight crunchy texture from the cornmeal bits. 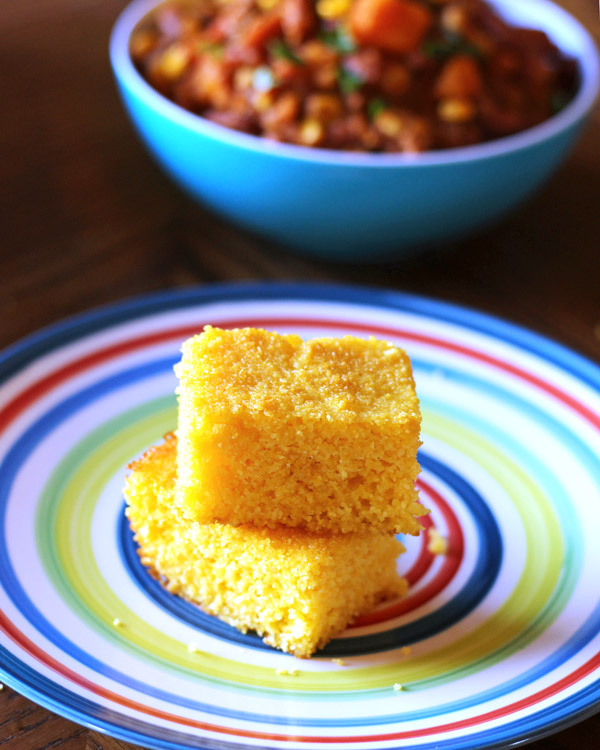 A few pieces of the wonderful cornbread are perfect on the side of a hot bowl of hearty chili. And it even makes great breakfast food. 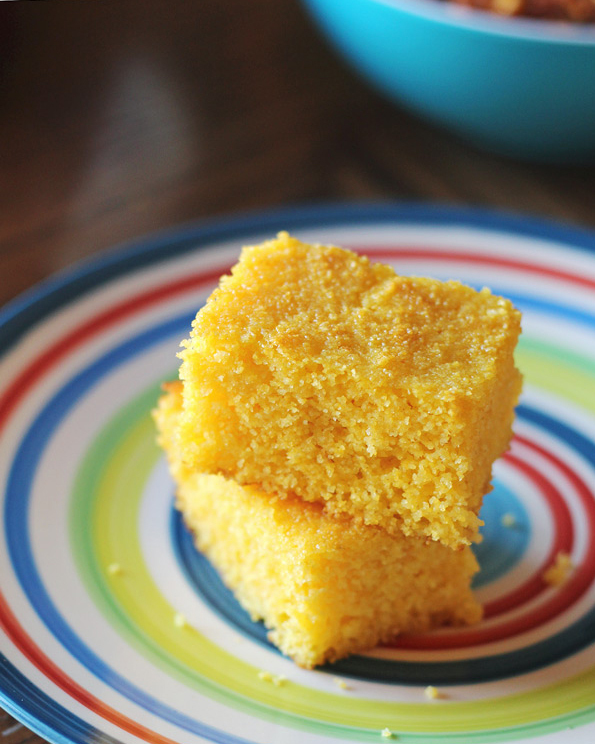 A delicious, light and fluffy cornbread that is gluten free! Perfect for chili or even breakfast. Preheat oven to 400 F. Grease an 8 inch square pan. In a large bowl whisk together the dry ingredients (cornmeal, salt, baking soda and powder). In a second bowl combine the wet ingredients (egg, butter, yogurt and honey). Make a well in the dry mixture and pour in the wet ingredients. Whisk until just combined. Pour into prepared pan and bake for 20-30 minutes until lightly browned on top (edges will be darker) and a toothpick inserted into the center comes out clean. Slice and serve with chili/stews or for breakfast. I would love to try this recipe, however I have a milk allergy which includes yogurt, buttermilk, and sour cream. Do you think it would work to substitute full fat canned coconut milk? I’m casein sensitive and I was wondering the same thing. I’m going to try subbing in rice milk and vinegar for dairy free buttermilk. That sounds like a great substitution. Maybe coconut yogurt? Since you really need the acidity. Great easy recipe, husband loved it, and you can’t even taste the yogurt! I used regular whole milk yogurt. Awesome! Thanks for your wonderful feedback. Can honey be added as well or have you tried using honey in this recipe?